Benefits eligible faculty and staff are invited to the Ira A. Fulton Schools of Engineering Employee Service, IMPACT and Fulton Difference Awards Luncheon. Register online by March 27 to reserve your meal. Get out your Hawaiian shirts and other island themed apparel! 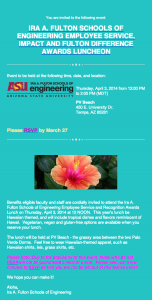 This Hawaiian-theme lunch will include tropical dishes and flavors. Vegetarian, vegan and gluten-free options are available when you reserve your lunch. Don’t miss this chance to celebrate with all those who make a difference at Fulton Engineering.